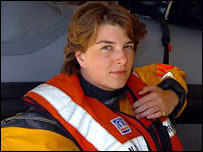 The youngest lifeboat helmswoman in the UK helped save a pair of walkers who got cut off by the tide despite being injured during the rescue. 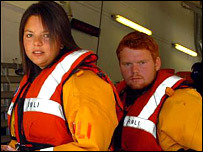 Ella Du Breuil, 19, and fellow lifeboat crew member Alex Evans, 19, leapt into action after getting a 999 call. The Atlantic College RNLI lifeboat members rushed to Nash Point lighthouse in the Bristol Channel after two men were reported to be in danger. As the pair saved the men, they both suffered shoulder injuries. The drama unfolded as Ms Du Breuil and Mr Evans and the other members of the lifeboat crew Ffion Llewelyn and Allan Steynor, were involved in a training exercise nearby. They received a call from Swansea Coastguard after Dean Webster and Adrian Hoare found themselves cut off by the tide at the base of the lighthouse, which is considered one of the most treacherous areas of the channel. The only way to save the men, who are from the Rhondda, was to anchor the lifeboat while the crew swam in with a line and lifejackets. "We thought about getting a helicopter but we decided to take the boat in," explained Ms Du Breuil. "It was very rough conditions with a lot of surf. "So I started to swim." But as she attempted the swim, she was buffeted against the rocks by the tidal surge, smashing her shoulder. "I was hit against the rocks by a very large wave and damaged my shoulder," she said. "I believe it was dislocated but it popped back in. I didn't feel the pain at the time. "I knew I had been hit but I thought I would deal with it later. "Once you are in that situation, you don't think about yourself." Despite her injury, she continued her journey towards the stranded men. When she got there, she discovered one of them couldn't swim so she gave him a lifejacket and pulled him through the breaking waves to the safety of the boat where crew members Ffion Llewelyn and Allan Steynor were waiting. 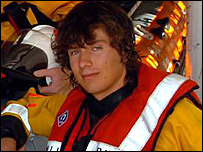 Fellow crew member Alex Evans then took over the rescue and swam towards the other walker. But he too was buffeted against the rocks sustaining similar shoulder injuries to Ms Du Breuil. Despite the pain, he continued the rescue and brought the walker to safety. "I didn't realise at the time," said Mr Evans, speaking of his injury. "But the job is hugely rewarding and the guys were very grateful to us," he added. Both Ms Du Breuil and Mr Evans are former students of Atlantic College who returned during the summer to volunteer for a summer camp and to crew the lifeboat. The RNLI lifeboat station has been part of the college since 1982 and is crewed by teachers and students working together. Speaking after the rescue, John Jones, the RNLI's divisional manager said: "This was a difficult rescue, which epitomised the courage and commitment of the RNLI's volunteer lifeboat crews."